I was first attracted to these insects by the dancing patterns on the river bottom as I walked along the Rio Sor (of which more in another blog) in Galicia, northern Spain. 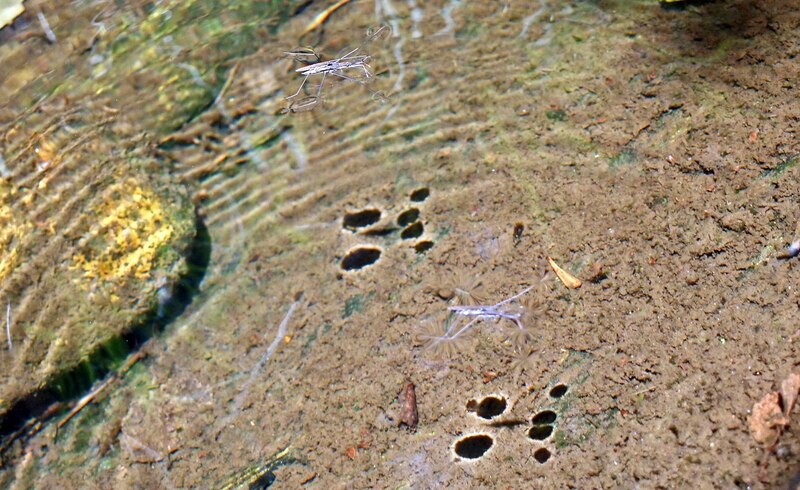 The shadows were cast by the reflections of indentations or depressions in the water surface made by pond skaters (also called water striders). As these were Spanish pond skaters, so perhaps we should call them patinador estanque! 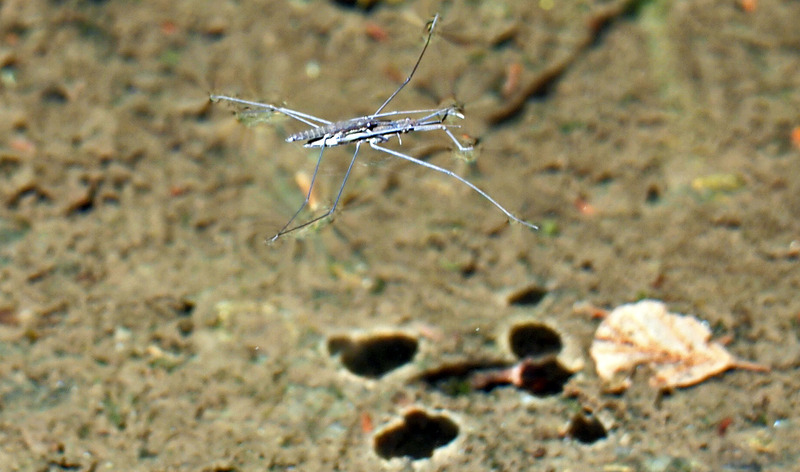 As is widely known, pond skaters have the ability to walk on water, which they are able to do (without getting wet!) as a result of so-called hydrofuge hairs on their bodies. What I had not realised though, was the extent to which their tiny body weight depresses the surface of the water without breaking the surface tension. I should however, say bodies (plural) because when I looked closely I saw that these pond skaters were mating, and the male was holding on atop the body of the larger female (below). It is said, though I doubt that anyone has watched for the whole time, that the males stay attached to their females for the whole of the mating season. They seem to fold up their legs and let the lady do the walking! Pond skaters (Gerridae) showing the male on top of the female. These are not the greatest of photos – I want to return this year with a good close-up lens – but they do show what a remarkable arrangement this is. The patterns themselves are delightful and dance about following the insects in a sort of loose pas-de-deux as they flit about the surface. 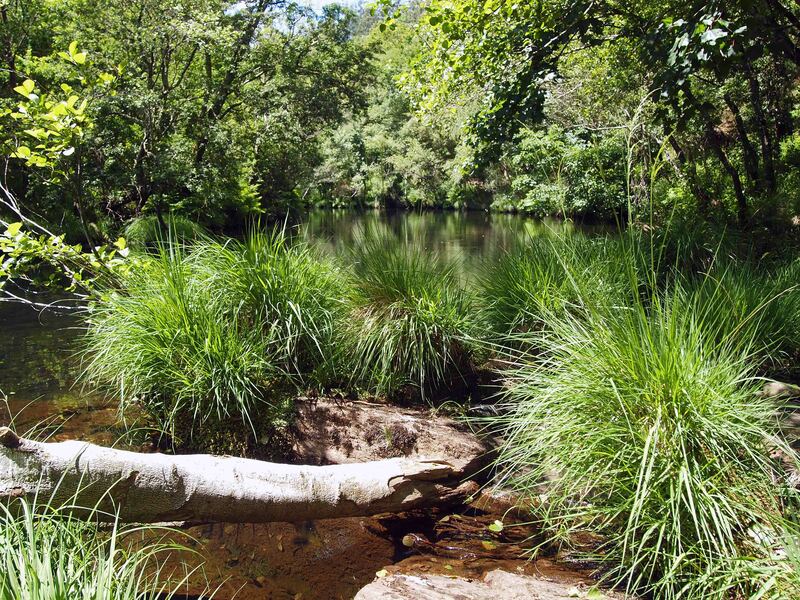 The site where the pond skaters were dancing along the banks of the Rio Sor (River Sor of Mañón) which flows between the provinces of A Coruña and Lugo, inGalicia, Spain. Previous Previous post: Don’t eat me: I’m poisonous! Just wanted to say how I admire your blog. 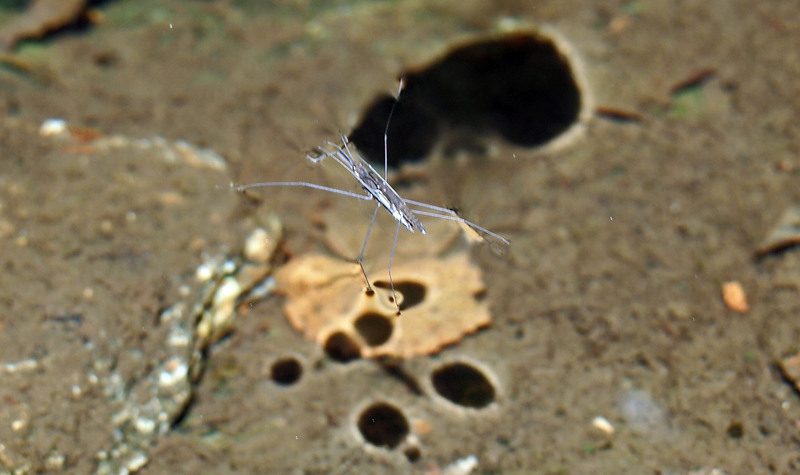 Fascinating about the pond skaters, which I am familiar with but the article was an interesting read. I’m not able to get out an d about at the moment, but hope to once problems with my feet are sorted out. Not surprising really as the poor things have had to deal with hikes since I was a teenager!! Looking at your site made me realise my business website need an update and overhaul! !